Other: saponins, tannins, vitamin C, mucilage, and other unknown elements. 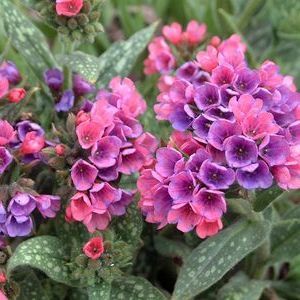 Pyrrolizidine alkaloids, found in other representatives of the family, are not contained in Pulmonaria officinalis. Used For: The herb is known to relieve pains, induce expectoration, treat diarrhea and stop bleeding, reduce inflammations, and heal wounds. Lungwort is widely applied to satisfy two medical purposes. First, it is used to relieve respiratory tract conditions, like bronchitis and coughs, particularly the ones linked with respiratory inflammations. Second, it is highly valued for its astringent properties. Thus, it can be applied to relieve diarrhea, particularly in children, as well as bleeding hemorrhoids. As a topical remedy it is applied to help heal wounds, cuts and other skin eruptions. Commonly mixed with: To relieve pulmonary diseases, the plant is used together with Lobelia, Coltsfoot, and White Horehound. Additional Info: The herb is widely met in shadowy areas, and is raised in the gardens. Preparation and Intake: To prepare an infusion, take 1-2 teaspoons of dried herb extract, fill it up with 250 ml of boiling water, and steep the mixture for ten to fifteen minutes. The result is consumed thrice per day. In form of a tincture the herb is used at a dose of 1-4 ml thrice per day. Safety: There is no data concerning the herb’s safety level. It is possible that the plant interacts with the medicine you use. Speak to your health-care provider before using the herb, and don’t use it without medical control.